Welcome to the December edition of the AXIe newsletter. AXIe is an emerging T&M standard that supports high performance instrumentation in terms of available power per slot, cooling and board space; and AXIe has seamless compatibility with PXI and LXI standards. It is our intent with this newsletter to educate you on the AXIe standard and its practical applications in the market. In this issue, our main article, Integrating AXIe and PXI into a Single Test System, shows how easily AXIe and PXI instrumentation modules may be integrated into a hybrid test system. Our second article, Introduction to AXIe-2, shows how our software specification utilizes PXI so that system integrators can easily build systems that take advantage of the benefits of both the smaller PXI modules and the larger, higher power AXIe modules. There are a growing set of products based on AXIe, ATCA Extensions for Instrumentation. In many ways AXIe is a supersized version of PXI, a modular architecture that also employs PCIe (PCI Express) but offers larger board area, power, and cooling. For all these reasons it is often referred to as the “big brother” of PXI. While AXIe brings these advantages to the market, it is still a young standard and has a fraction of the product breadth of PXI. This is particularly true for general purpose instrumentation and switching. PXI is sufficient for many, if not most, instrument types and has wide industry adoption. But what if you wish to use some of the high performance AXIe instruments along with your PXI instruments? Fortunately, users don’t have to choose between one and the other and can integrate both into a test system, using the product capabilities of each. AXIe, being the big brother of PXI, integrates easily with PXI instruments. 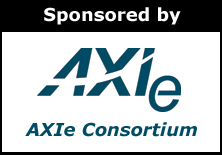 The AXIe consortium adopted the AXIe-2 specification in January 2012. This specification ensures that system integrators can access the necessary information to create an AXIe system in a consistent fashion. A key feature of the specification is that it utilizes PXI so that system integrators can easily build systems that take advantage of the benefits of both the smaller PXI modules and the larger, higher power AXIe modules. Combine instrument modules, chassis, and system modules from different vendors and still have an application work. Get a list of what is connected to the system including the addresses of the modules. Write a measurement application using the system. Use PXI and AXIe products in a single system and have a consistent experience across the standards.